Ball Catch door hardware is generally used on closet doors where a latch is not used or needed. The ball catch is mounted on the top of the door recessed in a hole drilled on the top surface. A strike plate is mounted on the door jamb where the spring loaded ball will catch and hold the door closed. A tug on the door will release the catch. 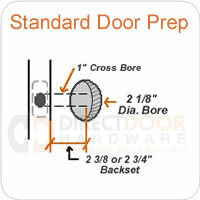 We frequently sell ball catch door hardware in conjunction with dummy door knobs for use on closet doors. More and more frequently we see people using double doors with a ball catch system rather than the traditional bifold door that can pinch your fingers when closing. You can buy simple drive in ball catches, nicer ball catches with attached mortise plate, or higher end roller catches depending on the way your own doors are prepped. Ball catches are also available in many finishes to coordinate with your other door hardware.